You are viewing articles tagged planning. The information booths in the Grove are turning out to be somewhat less then useless. So much for tourists seeking advice. There will be a public meeting tomorrow about Museum Park. A new master plan will be presented, because the old plan was considered too elaborate and expensive. I find this slightly depressing. Next Thursday (October 4), the City of Miami Planning Department is having a meeting to discuss plans for the design of Museum Park. No idea what they did to publicize this meeting, but I note that their web page doesn’t even mention the time (it’s 6 pm). Inexcusable. Michelle at Museum Park Forum caught this. It’s at the Orange Bowl Stadium Athletic Club. Update: The bastards changed the time to 4:30pm! WTF, they’re claiming conflict with a later event, but isn’t this a transparent effort to make it impossible for many people to come?? Why isn’t anyone making noise about this?! When I was a kid, my bike was indispensable to me. I explored the neighborhood, venturing farther and farther from home as I got older, learning about my world. Somewhere along the way I acquired a driver’s license and a car, and for a long time I was a car-only guy. But over the last few years, I’ve enjoyed exploring my urban landscape by walking, and I’ve come to appreciate the perspective that comes from low m/h travel. But walking is out of proportion as a way to explore our sprawl-based metropolis. And so I’ve come to re-discover areas of my own neighborhood on my bike, and have again begun venturing far beyond. It’s amazing what you notice — how your very relationship to the streets changes — from a bycicle. Leaving the office in the evening I ride along SW 8th Street, or Calle Ocho as it is most commonly referred. It is the epicenter of Cuban culture in Miami. 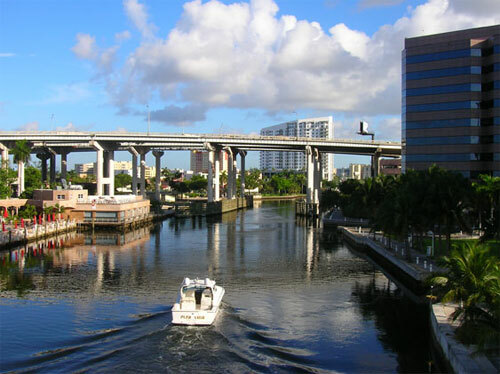 Urban conditions vary along the corridor, but the particular stretch from our office on SW 25th Avenue to downtown is fairly walkable and presents a mixture of retail, restaurant and cultural offerings. Nonetheless, the street is absolutely inhospitable to the cyclist, which is why the majority of people ride on the sidewalks. You asked for more Miami 21 meetings, and you’ve got ‘em. Here’s a schedule from an e-mail they just sent, also available on the schedule page of the Miami 21 website. I’ll go on record once again saying that the website is a mess, and that a project of this magnitude (and budget) should be ashamed for dealing with the internet in this flimsy way. Still, the information is there, and here are your opportunities to learn what it’s about and speak your peace. Here’s an article I wrote for Damn Magazine back in June of 2006. It was published in October, but has never made it online before. I took the photos back then for the article, though in the magazine it ran with Julian Martin’s much better pictures. I’m sitting in a shabby banquet room in the Eugenio Maria De Hostos Neighborhood Service Center in Wynwood, surrounded by huge pieces of foamboard covered with maps, diagrams, charts, and computer renderings of buildings and streets. Elizabeth Plater-Zyberk is just wrapping up her presentation — one she’s given four times in the last week — and opens the floor up to comments. The low-level grumbling that had accompanied her talk resolves itself into a succession of complaints, many followed by applause from a healthy proportion of the 100 or so assembled. Plater-Zyberk takes all this in stride, answering each person without a shred of disagreement. Yes – the plan needs work. Yes – they would revisit that aspect to see if it could be improved. Yes, yes, yes. We’re talking about Miami 21, the state-of-the-art master plan that’s been Manny Dias’s dream ever since he was elected mayor of Miami in 2001. It took years of preparation, but finally a firm was hired, and today we have a proposed plan. Now comes the hardest part: getting the public to agree to it. Miami 21 is an effort to marry the best ideas from the last thirty years of urban planning to the weird realities of Miami’s existing cityscape. It focuses on what types of buildings should go where, in an effort to create a city that is convenient and pleasant for drivers as well as pedestrians. It’s not as impossible as it sounds: groupings of medium and high-density buildings with storefronts and plazas along the ground floor, plenty of trees, and nice wide sidewalks, and who wouldn’t walk a couple of blocks to run an errand? And the organization and higher density makes public transportation start to look like a viable option. Beyond that, the plan incorporates historical preservation, emphasizes open green space, hearts art and culture, encourages mixed-income development, and generally hits all the feel-good talking points that wide-eyed urban planners love. Key to all this is something called the transect. It refers to the gradual transition from nature to the urban core through distinct zones: rural, suburban, medium-density, urban. The transect calls for throwing out old, complicated zoning codes in favor of these zones, which encourage building along old-fashioned models: suburbs, for example, begin to look more like small town under this system, with centers of common public space, shops, and parks. The transect system also eliminates the variance system, under which politically connected developers were able to have the rules changed on case-by-case basis to squeeze more profit out of their land at the expense of community coherence. Which brings us back to the meeting, and yes: the complaints. For the most part, the meeting is attended by developers, realtors, and big-time land owners, all of whom have the most to loose from certain aspects of the plan. In the effort to normalize building densities through the city and apply some control to the growth, sweeping changes have to be made to the zoning codes, and these changes have winners and losers. The landowners and developers whose ability to build gigantic concrete’n‘glass condos has been circumcised are pitching a fit. You can’t blame them, but neither should you really accommodate them, right? It’s our damned city, and we should be able to put our needs above those of developers who want to cash in and move on. This is about the vast majority of the people . . . those who actually live and work here. Obviously and unfortunately, those people are scarce in the process that goes into these sorts of plans, and while the planners try to do what they believe we want, their ability to push back against the big money interests in hindered by a lack of voice from the other side. But actually, the problem is worse than that. Not only are many people not aware of the process, but if they were aware, they would be quite skeptical of designing a city with a big fancy plan. While our responsibility for the natural environment has enjoyed a surge of popular support over the last several decades, the same can’t be said for the urban environment. Some cities are loved and others hated, but we don’t really think about how we can shape and influence our cities through concentrated action. This is exactly what urban planners do, though, and it’s what they’re doing with Miami21. Too bad the timing stinks. Everyone knows that we’re coming off a major building rush right now. Hundreds of building and renovation projects of all shapes and sizes are taking place all over town, and while many more are in the planning stages, conventional wisdom has it that anyone who hasn’t broken ground already is going to find it increasingly difficult to do so. As the housing supply expands and prices (especially for condos) begin to level off, the increases in building materials are going to make all sorts of numbers just not add up. So great; if we can expect a major building boom once every 20 to 30 years, and we just wrapped one up, what are we doing; planning for a rush of building in 2030? There is good news, though. For one thing, many of the buildings now going up adhere to some of design rules of new urban thinking. There are shops along the first floor, the parking garages are hidden from the street, and the buildings are set back at the fifth or sixth floors, giving them a sense of scale from the sidewalk. This is particularly noticeable in Edgewater, the area east of Biscayne Boulevard between the Omni and I-195. 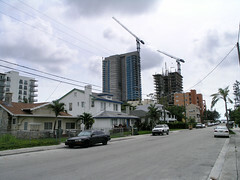 Few places have seen as rapid a transformation over the last few years as Edgewater, where single-family homes and small apartment buildings (some dating back to the original Miami construction boom in the 1920s) mingle with empty lots, construction sites, and gleaming new towers. Throw in a few corner markets, and when all the dust settles we may just have a real walkable community on our hands. It’ll get another boost when the streetcar system which is planned for the area comes online in 2010. So there’s the city of the future for you: it intelligently mixes high, medium, and low density buildings with nice sidewalks, public spaces, and practical public transportation. Actually, it looks suspiciously the way cities all over Europe have looked for an awfully long time. And the plan? Well, Plater-Zyberk will have her hands full between now and September, when the city commission votes on the final plan. Only time will tell how much effect the plan will have, though. At a meeting last week about Miami 21 which I had on my calendar but forgot to attend anyway, nothing much happened. The project is coming along but vewy, vewy, slowly. Update: I’m working on a calendar section. Check in the bar on the right.